Who else has a toddler that likes to be arbitrarily picky?! I never know what she's going to request (it's almost never what I make...*eyeroll*), so I like to have some quick and premade options on hand. 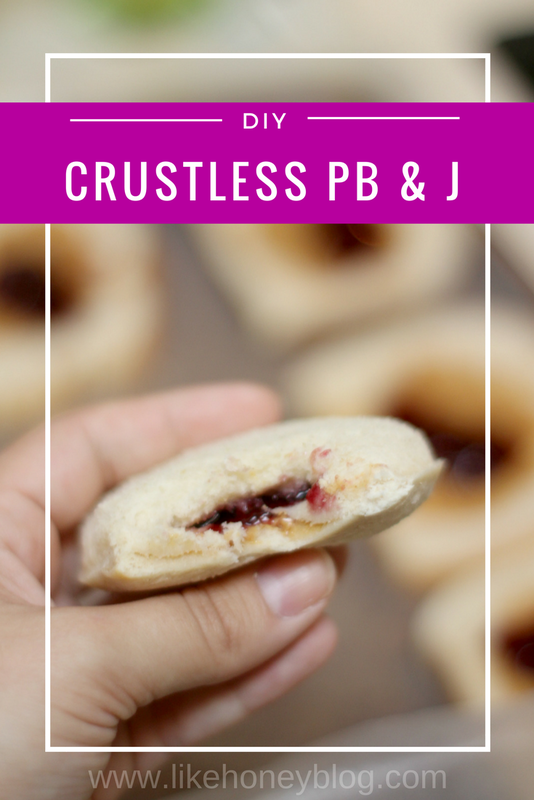 One of our favorites is the frozen crustless PB&J sandwiches, Uncrustables. Those Smucker's are expensive, though! (See what I did there?) When you've got two kids chowing down at least once a day, you've got to come up with a more cost-effective solution. So I got a little crafty, whipped out my trusty drinking glasses, and went to work. Here's how I make and freeze my own "Uncrustables" for literally pennies! Smoother than a fresh jar of Skippy Peanut Delight...because Aldi prices. To start off, you'll need a loaf of bread, jelly, and peanut butter. If you have an actual sandwich sealer that's even better, but I didn't feel like spending the money on one when I had these perfectly round little drinking glasses that did the job just fine! I like to arrange myself a sort of assembly line to speed up the process. It works double because you'll need the cookie sheet in a few. Make sure you only spread the condiments around the very center of each slice--the rest of the bread gets cut off in the crust removal process and you don't want jelly seeping out of the sides of your sammies! Did you find yourself a sturdy round glass? Center that bad boy up and smoosh it down onto the bread like so. Then just peel away the excess bread (do this while the sandwich is STILL in the cup!) and pluck your perfect little Uncrustable out of that cup. Got it stuck? Give you glass a few shakes like the last drop in the ketchup bottle and it should break free. If you're not freezing any, then that's it! Great job! If you want to prep some meals ahead or just save yourself some noontime sanity later in the week, read on to see how to correctly freeze and store your freshly made sammies. Here's where that cookie sheet came in extra handy! Just line up all of your crust-free PB & J's and pop them in the freezer for about 20 minutes. This will allow them to flash freeze and keep them from sticking together in the freezing process. I lined my sheet with wax paper just to be safe. When they're nice and solid, just slide them into a labeled and dated freezer bag and you're good to go! These crustless PB & J's make great picnic take-alongs, school lunches, and even snacks! My kiddos aren't school-aged yet, but when they are, I'll definitely have these budget friendly bites on hand at all times! That makes each of these sandwiches around 21 cents! That's less than a QUARTER! Talk about a budget-friendly meal. Feel bad losing all of that extra bread? Save the discarded crusts for bread puddings, homemade croutons, breadcrumbs, or just go feed the local ducks. There's no need to waste! I have a picky eater too! I love how you suggested keeping them from freezing, my only solution with similar things has been to freeze them separately, but this is a great tip. So cute!! And way cheaper than getting all the frozen uncrustables! - Shelby G.
How clever! I've never thought about using a glass to cut the sandwiches! I kinda want to make a batch of these for my lunch tomorrow! I haven't had PB&J in forever and now I'm craving it! This is a really great idea! What is the best way to defrost them once you take them out of the freezer? How long does it take to defrost? This is a great post! I love how you even broke down the cost per sandwich to make. This is such a clever idea. I also liked the ideas you gave to make use of the extra bread left over! Great ideas!